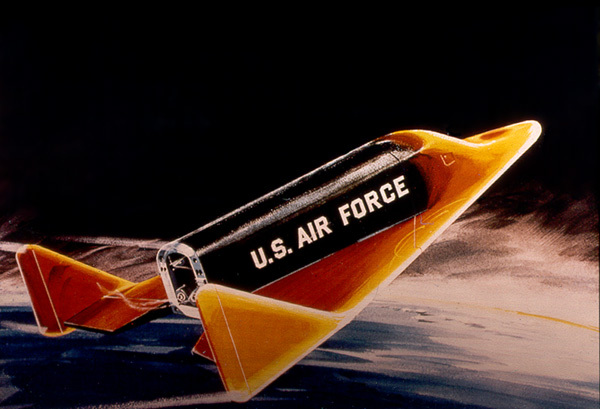 In 1960, Philip Bono, a Space Vehicle Design Specialist with the Boeing Airplane Company, envisioned a manned Mars spacecraft which would outwardly have resembled the X-20A Dyna-Soar single-seat orbital glider that the company was developing for the U.S. Air Force at the time. Bono’s Mars glider would, however, have been much larger than Dyna-Soar – large enough to hold an eight-man crew. The flat-bellied Mars glider would have measured a whopping 125 feet long and 95 feet across its delta wings. Bono, in common with many Mars exploration enthusiasts of the early 1960s, optimistically targeted his expedition for the favorable 1971 Earth-Mars transfer opportunity, when the energy required to reach Mars would be at a minimum. Prior to launch, the forward section of Bono’s glider would have been lowered into place atop its rear section on the launch pad.